However, in Clear Lake City, TX it has been much harder to lay out a trail with equivalent beauty. 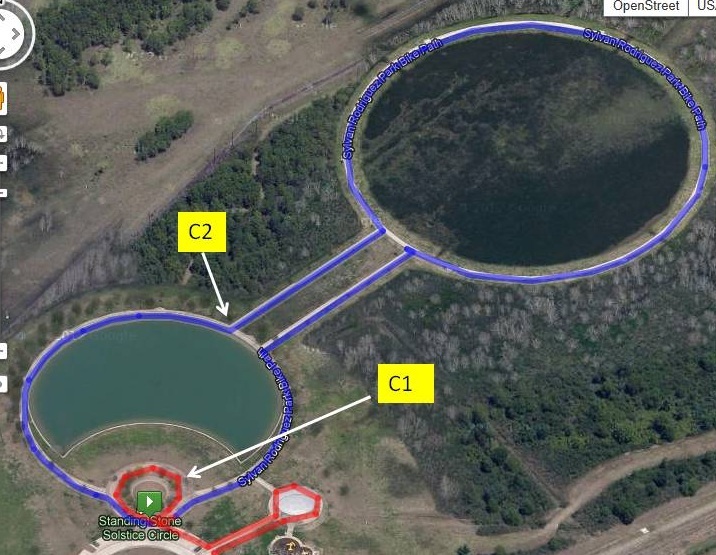 The Clear Lake City Marathon Training Trail is an urban running path located within the expanse of Clear Lake City, Pasadena and Taylor Lake Village that has been created with the intent of establishing an area where runners can train for various distance events on a marked and measured route. The concept was originated in August 2009 by Paul D. Maley (a runner and resident of the Pinebrook subdivision) who first submitted the proposal to Harris County Precinct 2. 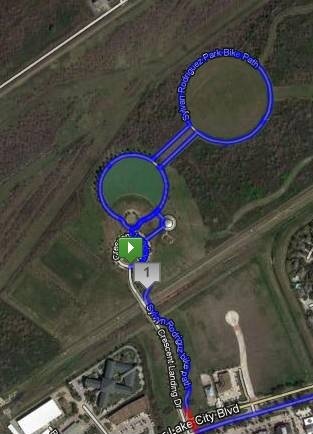 The ‘trail’ is a path (drawn using the online tool MapMyRun) winding approximately 26.2 miles (42.1km) around the Clear Lake area, arbitrarily starting and ending at Sylvan Rodriguez Park. The CLMTT has been set up in cooperation with and through the generous support of Commissioner Jack Morman, Harris County Precinct 2 and the cooperation of Clear Lake City subdivisions: Bay Pointe, Bay Knoll, Bay Glen, Bay Forest, Bay Oaks, Brookwood, and Pinebrook. As the principal local running clubs have engaged in developing the overall route, recommending improvements, and agreeing to help maintain the trail we further recognize Bay Area Fit (BAF) President Charlotte Bailey, Clear Lake Fitness Club (CLFC) President Rick Burris and Bay Area Running Club (BARC) President Dennis Malloy for their assistance. Note that CLFC was replaced by the Houston Area Road Runners Association (HARRA) in 2018. Note, this is not the creation of a race or a marathon! The streets that are shown on the maps below have already been in use for training purposes by the local running clubs. This project is simply a formalization of the routes which have been used for years. 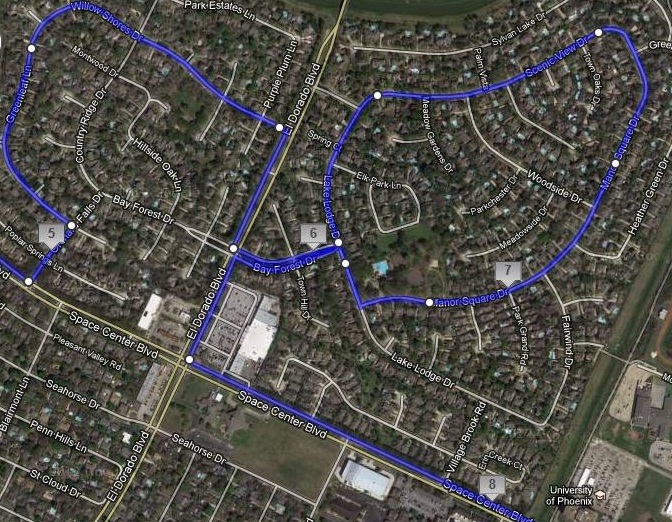 Runners from the three running clubs above live in all of the subdivisions so this is for the residents who are runners. The only thing we are doing is marking the training trail so runner/residents will know where each of the mile markers are and how to navigate measured distances to help them achieve their training goals. The trail can be used by those training for 5k, 10k, half marathons, and marathons. It has been designed to allow runners to start at any point so that small sections can be run based on runner/club choice to fit any training regimen. 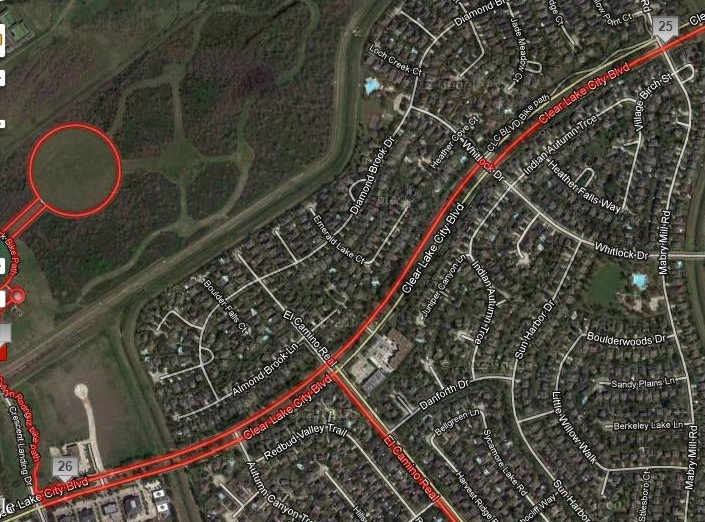 It is hoped that future developments along areas such as within the Harris County Flood District will allow us to replace certain street sections with actual trail. The broad overview map is shown in the next figure, while more detailed maps follow. Parking areas are shown above. Runners are requested not to park in the subdivisions. There are three named segements along the core section of the trail each approximately three miles in length. The overall purpose for naming portions of the CLMTT is to recognize the enthusiasm and dedication of ordinary runners in order to stimulate Clear Lake residents to join running club programs and improve their health and fitness! Guidelines for naming these sections are as follows: the honoree should be living; the honoree’s name is changed once per year usually in May; the honoree should be someone who is considered an ordinary runner in the sense that this person is not famous and does not win awards; the honoree should serve as an example to other runners based on his/her dedication to the sport; there is no age, gender or other limitation related to honoree selection; the decision on the names of the honorees should be made by the respective running clubs; the names of all three CLMTT sections should be updated at the same time; honorees should only be current members of one of the running clubs and can be officers or members provided they meet the other criteria. 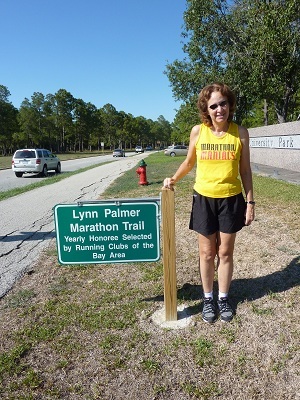 2011 honoree Lynn Palmer. Photo by P. Maley. 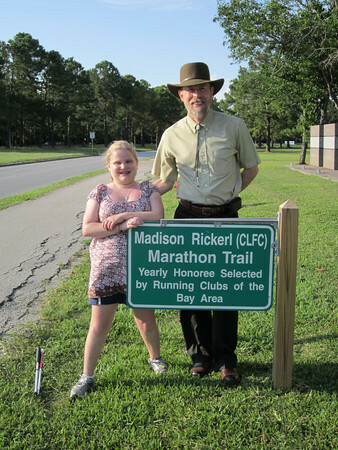 2012 honoree Madison Rickerl (left) with Clear Lake Fitness Club president Rick Burris. 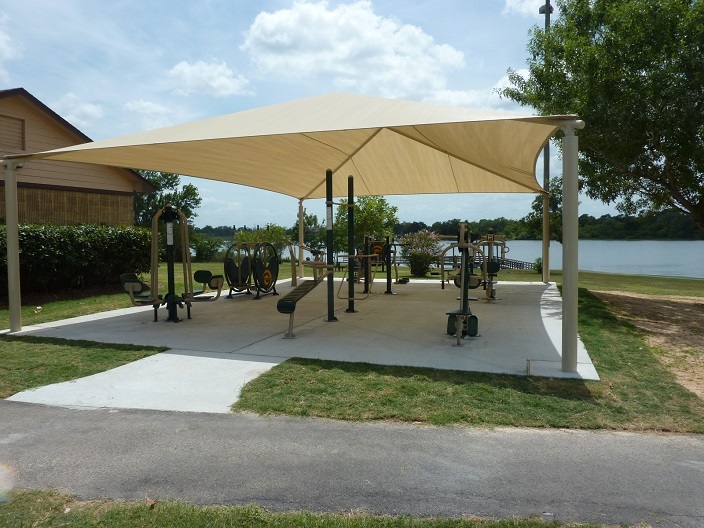 A stretching station is located at Clear Lake Park (Mud Lake side) and is depicted below. Bathrooms and water stations may be found in each of the parks but runners should check the hours of each park to know when they will be available (usually not earlier than 6 or 7 am). 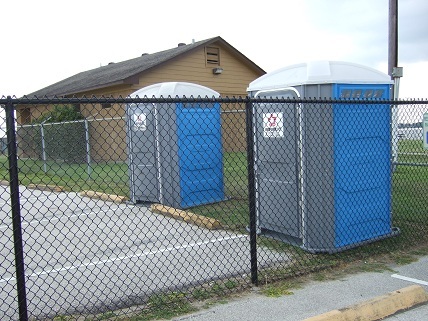 For those running earlier, the running clubs now have a specially designated bathroom area (provided by Precinct 2) across from Clear Lake Park on the lake front which must be accessed through club management. 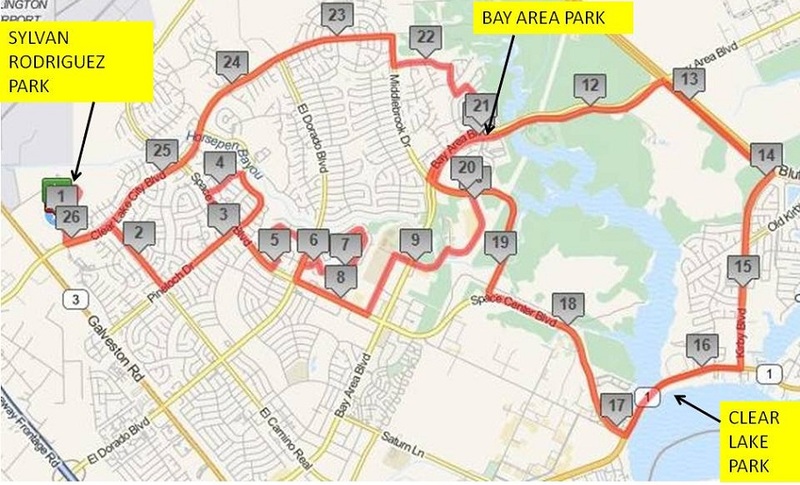 The core of the route is the loop (miles 11-20) that begins at the intersection of Bay Area Blvd and Middlebrook Drive, continuing east along Bay Area Blvd to Red Bluff, then turns southeast to where it intersections Kirby, continues south into Taylor Lake Village. 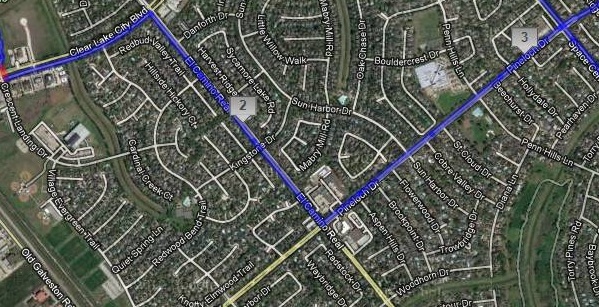 Then it cuts west on NASA Road 1 to Space Center, northwest on Space Center to Middlebrook, then north to Bay Area Blvd. 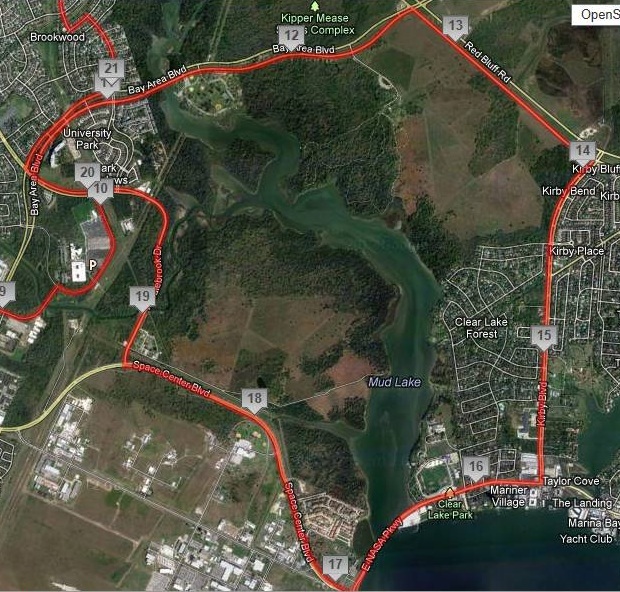 This portion is 9.8 miles in length (15.8km). The 9.8 mile core route map as provided by Harris County Precinct 2. The rest of the trail is divided up into segments. They are shown in sequence below, but again, runners can begin any place they choose. The CLMTT route is defined by these maps but when runners are on the course they can look for two types of decals that have been inserted on the sidewalk. The first is the mile marker (MM) which starts with “1” and ends with “26”. The second is the arrow marker (AM) which points the direction in which the runner should turn to help them avoid going off the route. It is up to runners to use these maps to help stay on the proper measured route. DIRECTIONAL ARROWS: Figure 6 shows a directional marker. It is circular and about 4-inches in diameter, placed on sidewalk (corner location rather than in the middle), and with a non-slip surface. Each marker is secured using a special adhesive with a cure time of between 4 and 14 hours. The entire 26.2 miles features about 40 of these markers strategically placed to properly direct runners. Markers are only placed at key turns so you may go quite a ways without seeing one. The best way to use the detailed trail maps below is to print out those sections you plan to use and get a good idea where the key turns are located. 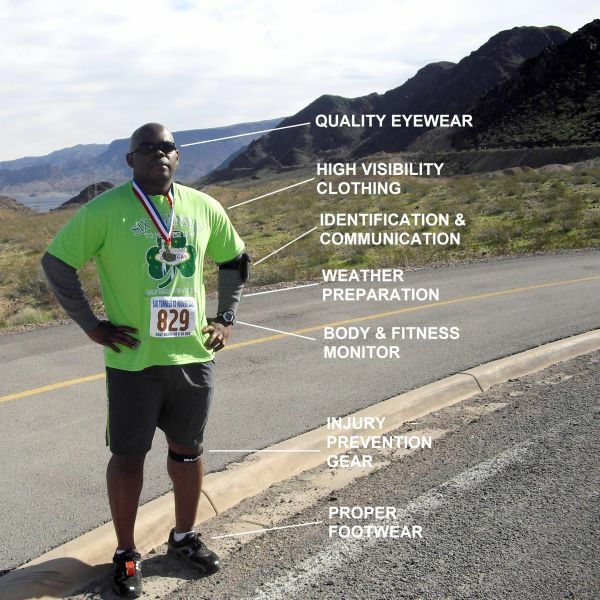 It is entirely possibly that during your run you may not be looking down and thus will miss key markers! 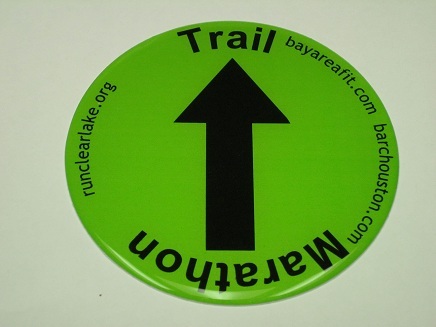 Actual direction marker placed on concrete sidewalks along the entire 26.2 miles of trail only at critical turn points. Courtesy R. Burris. MILE MARKERS: Markers will also be placed where there is a mile marker number on the images that follow. An example of marker placement in a corner of sidewalk. Point of tennis shoe is the location. Where home owners associations have wanted to participate in approving the marker installation locations, we have worked with them (see Figure 6A above) to assure minimum impact on the local infrastructure. The formal 26.2 mile long CLMTT starts/ends in the Sylvan Rodriguez Park (SRP). But runners/clubs may start their training from any place along the route. If it is desired to start at SRP the next image shows the overview of the walkways around this small park area leading to mile marker 1 as one proceeds out toward the entrance. Figure 7 shows the path inside the park, along the bike path and out to Clear Lake City Blvd. To follow the track for the first mile consult figures 8A and 8B. The start point is the green marker. Run counterclockwise along the small red circle (C1) back to the green marker. Then continue counterclockwise along the blue circle to C2 continuing in a counterclockwise direction to the second blue circle following the route back to the first blue circle and then to the green marker. Then continue clockwise along the white lower arc following the red line which leads to the small red circular pavilion at C3 in figure 8B below. 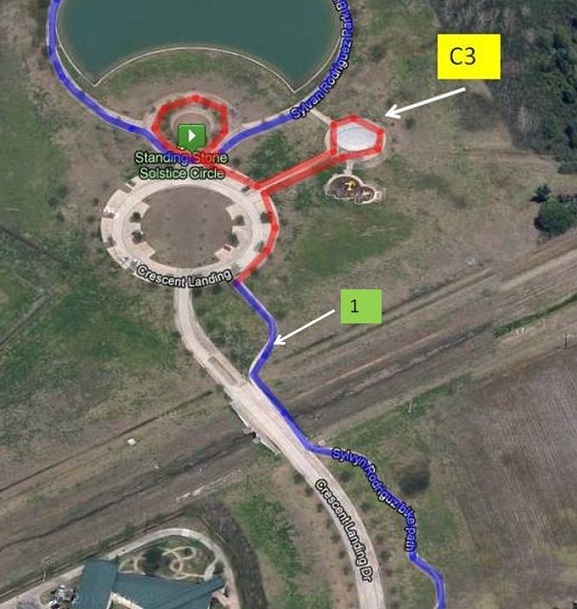 Go around the circular pavilion C3 in a clockwise direction and return to the Crescent Landing circle following the redline until it intersects with the blue bike path. 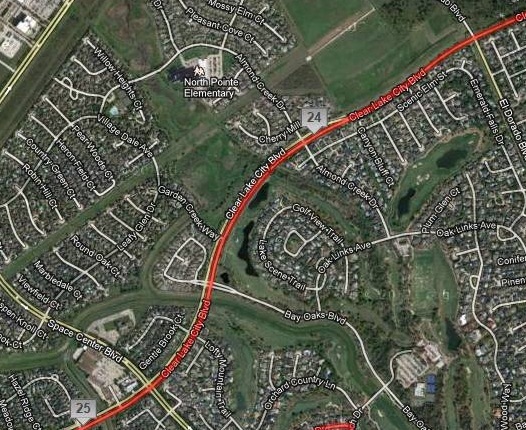 Follow the bike path past mile marker 1 (shown in green) out to Clear Lake City Blvd. The trail proceeds from SRP south to the park entrance, then you have to run across busy Clear Lake City Blvd. A convenience store can be found at the Shell station here. Runners proceed left onto the sidewalk remaining on the right side of Clear Lake City Blvd. Continue east on Clear Lake City Blvd until reaching El Camino Real. Turn right and follow it to Pineloch. Cross El Camino Real at the Pineloch intersection carefully and proceed down Pineloch to Space Center staying on the left side the entire time. 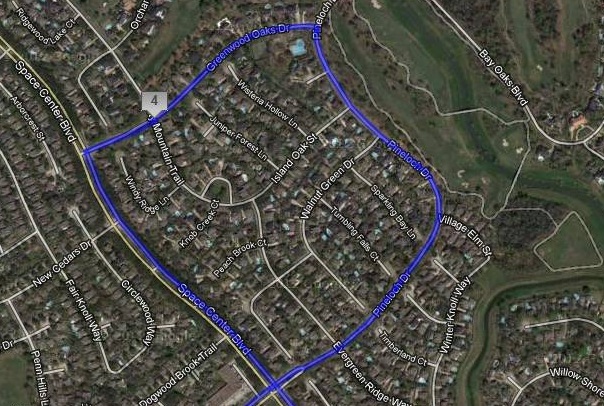 Carefully cross Space Center staying on Pineloch (left side) through Bay Oaks subdivision. Turn left at Greenwood Oaks and follow until you are back at Space Center. Turn left and continue along Space Center passing the fire station. Continue down Space Center to Orchard Falls (Bay Forest subdivision). Turn left and go to Greenleaf. Turn left following Greenleaf until it becomes Willow Shores. Follow Willow Shores to El Dorado. Right on El Dorado to Bay Forest. Cross El Dorado and stay on the left as you go on Bay Forest. Left on Lake Lodge which becomes Scenic View which becomes Manor Square. At the end of Manor Square turn right on Lake Lodge, then left on Bay Forest (stay on the left side). Left on El Dorado being careful as you pass the Kroger Shopping Center due to cars exiting. Note: a convenience store is located at the Shell station (intersection of El Dorado and Space Center). Turn left on Space Center. Stay left on Space Center to Falcon Pass where you turn left. At Krueger get on the right side and turn right on Krueger passing Clear Lake High School on the left and police station on the right as you arrive at Bay Area. 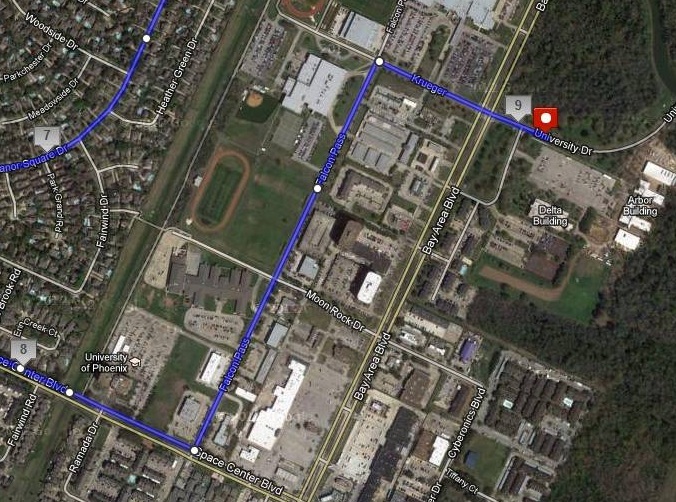 Carefully cross Bay Area onto University (University of Houston at Clear Lake-UHCL) staying on the right side where there is sidewalk. Continue on the ride side of University to Bayou Road. The sidewalk disappears after a time so you will have to be careful as you run either into oncoming traffic (left side) or stay on the grass on the right side. Continue until you see sidewalk on the left side of the road in front of the parking lot. Head toward Middlebrook Drive. Left at Middlebrook Drive to Bay Area following the directional arrows. 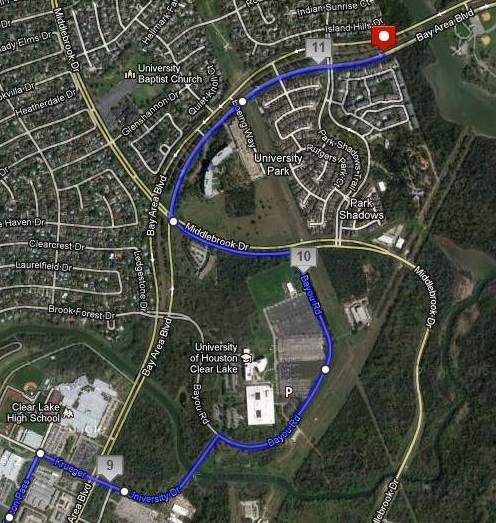 Carefully cross Middlebrook onto the first part of the 9.8 mile core trail and stay on Bay Area. At the intersection of Bay Area/Middlebrook (between MM10 and MM11) is the first of three designated signs honoring a specific runner. This section is called the “Bay Area Trail”; it follows the asphalt portion along Bay Area passing Bay Are Park and the Armand Bayou Nature Center to Red Bluff. Note: a convenience store is located at the Valero station (intersection of Bay Area/Red Bluff). Right on the sidewalk to Kirby. Note: a convenience store is located at the Chevron (intersection of Red Bluff/Kirby). At the Kirby/Red Bluff intersection (MM14) is the second of three signs honoring a running club member. Right on Kirby all the way to NASA Road 1. Note: a convenience store is located at the Shell station (intersection of Kirby/NASA Road 1). You will cross a bridge with scenic Clear Lake on your left and Mud Lake will be on your right. Right on NASA Road 1 to Space Center. As you run here, the NASA Johnson Space Center is on your left and Armand Bayou Nature Preserve on your right. Right on Space Center to Middlebrook. At this point (MM17) is the third of three signs set up by Harris County Precinct 2 honoring a runner. 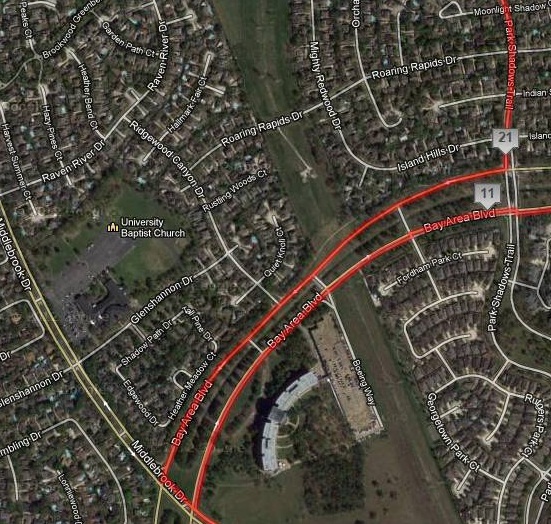 Cross Middlebrook onto the sidewalk (northwest side) and continue past UHCL to Bay Area. At the Bay Area/Middlebrook light, first cross to the other side of Middlebrook. Then carefully cross Bay Area and immediately turn right on the sidewalk (staying on the north side of Bay Area Blvd) until you arrive at Pine Shadows Trail. Turn left (stay on the left side of the sidewalk until recommended otherwise for the next few miles) on Pine Shadows Trail and continue to Mighty Redwood Drive. Turn left and go a short distance to Middle Forest Drive. Turn right and continue to Walnut Pond. Turn left and continue to Middlebrook Drive. Then, carefully cross Middlebrook staying on the left side (Pinebrook subdivision) and continue to Clear Lake City Blvd. Turn left, remaining on the south side of Clear Lake City Blvd. until arriving at El Dorado. Cross El Dorado remaining on the south side of Clear Lake City Blvd. and proceed to Space Center. Carefully cross Clear Lake City Blvd at the Space Center light, wait and cross Space Center continuing on the north side of Clear Lake City Blvd in a westerly direction back to Sylvan Rodriguez Park. Enter Sylvan Rodriguez Park turning right on the bike path until you reach the parking lot. This will complete the full 26.2 mile route. 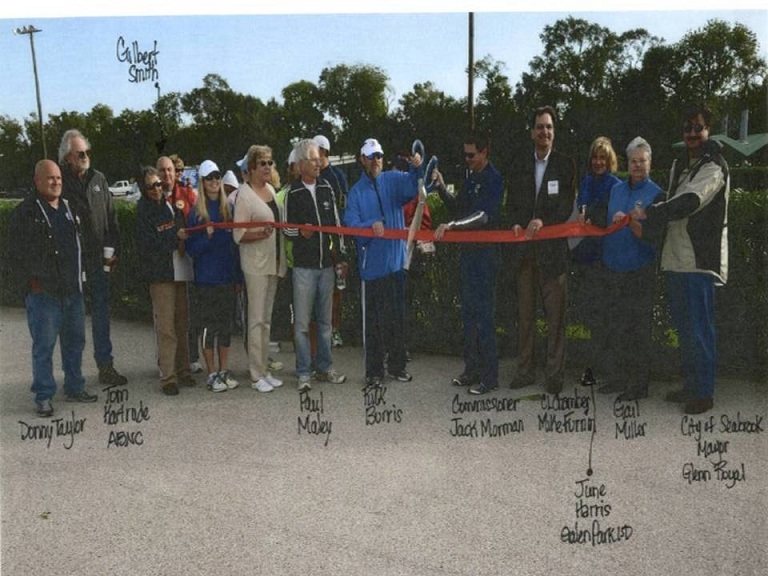 Opening of the Bay Area Trail portion of the Clear Lake Marathon Training Trail occurred on October 27, 2012. Additional participants not identified on the photo by D. Acker (Pct. 2) are (to the immediate left of P. Maley): Sandy McKinney (BAF), Julie Morris (BARC) and Terry Frank (CLFC). Runner safety is the number 1 priority. That means that each runner (whether a member of a running club or not) and running club must use common sense when running the sidewalks, streets, asphalt and any other pathways to ensure that they are not injured or worse. It is your personal responsibilty to ensure that you run safely and do not fall or injure yourself due to your own carelessness. Your responsibility includes being sure you have good vision and that you recognize that trip hazards can exist on ANY sidewalk or street or path! One of the more common problems is when the tip of your shoe encounters the lip of a protruding sidewalk segment causing the runner to fall forward onto their hands, knees, and arms. Wearing gloves may help mitigate such a fall but may also be uncomfortable to wear except in winter. Other potential injuries may occur due to planting a shoe in a hole/depression because of distraction or misjudging your footing. Due to Houston area weather variations, sections of sidewalk can uplift or depress due to temperature changes. 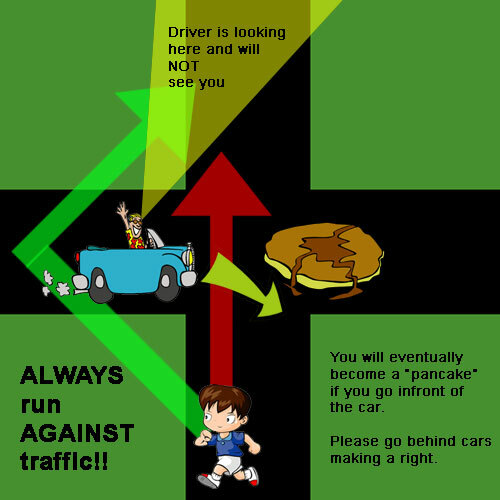 Remember it is your responsibility to run safely. It is very easy to encounter a trip hazard if you are not careful. In addition, after a heavy rain, some sections of trail my be slick or even collect water, though efforts have been made, particularly with Harris County Precinct 2 assistance to try to mitigate such a situation. You should run only under good lighting and visibility and runners should be self-supporting in their efforts, avoid littering, and to clean up after themselves in order to maintain the integrity of the trail and continuing good relations with the subdivisions through which it passes. All runners should exercise great care when crossing major intersections (look in all directions! ), when running in the street or on the sidewalk to avoid vehicles, trip hazards, bicyclists, etc. Before setting off on a long run be sure you have a hydration plan (especially in summer) and have checked weather radar to be sure you know local weather conditions are/will be safe during your run. Never run when lightning is present within 5 miles of the course. Wear a headband or hat in warm/hot weather and if on a long run, carry gels and / or water as needed; carry a small towel to wipe away sweat. Be sure your exposed body surfaces are adequately protected from the Sun. If you can, carry a lighweight cell phone with fully charged battery; this may be helpful in case of problems if you need to call for assistance or see/experience an emergency in progress. Avoid wearing headphones as it makes you less aware of what is going on around you. Female runners especially should consider to avoid hidden trails with no visibility, run with a partner or with a leashed dog with big teeth. If you encounter a fallen tree, branches or vines, downed fences, damaged sidewalk section or other interference that would block runners from crossing part of the trail, contact your local running club so they can inform appropriate responsible authority. The CLMTT uses urban sidewalks and paths to define the route. Since it passes by three parks (Clear Lake Park, Bay Area Park and Sylvan Rodriguez Park) and a number of churches and schools (e.g. 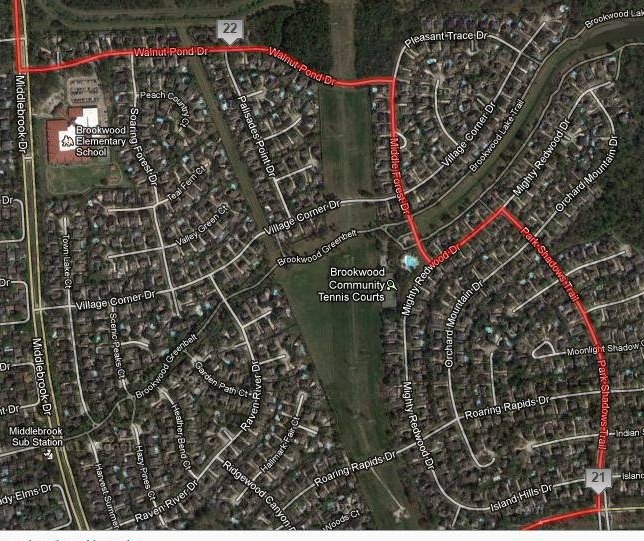 University of Houston at Clear Lake and Clear Lake High School) runners should consider to stage from one of these locations most convenient to them but preferably one of the parks where there are bathrooms and adequate parking. Do not park your car along the street in the neighborhoods shown. Use Google Maps to zoom in on any part of the CLMTT and print out maps of the area or memorize the route in order to keep on track. Runners can start from any place along the route redefining that spot as “mile zero” and proceed in one direction or another to run their goal(s). Driving the route ahead of time may help enhance the experience and minimize the chances of getting lost. Runners in training who are not experienced with traffic hazards should stay on sidewalks as much as possible. When running on the street always run into the direction of oncoming traffic so they can see you and you can see them. If running in poor lighting such as predawn or even at night (not recommended), use a head lamp or better yet, run in the street when there is minimal traffic. Wear bright clothing/reflective markers to be sure you can be seen. 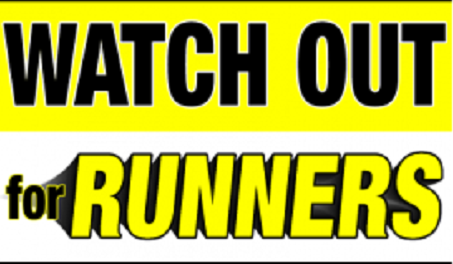 As you run be on the lookout for vehicles and assume that any vehicle you see is out to hit you. This is the best defensive running strategy. Don’t forget to perform stretching exercises before and after your run! The CLMTT is generally set up so that runners can run in open, visible spaces—not secluded places. Due to lack of real trails in the Clear Lake area, we are attempting to make maximum use of existing surfaces when physically and politically practical. We hope to eventually move portions of the CLMTT off streets and onto more trail-like pathways in the future. This would enable runners to encounter fewer traffic issues, to find more scenic views and create less intense energy transferrence from the surfaces through the body. Due to approval issues and other factors, making this happen now is not possible. The obvious candidates are trails along drainage areas, those controlled by the Harris County Flood District as well as the abandoned Clear Lake Golf Course. Running clubs are the best resources in order to help guide you in proper training techniques. Special thanks to Gail Miller, Gilbert Smith and Donny Taylor of Harris County Pct 2 for their ongoing efforts to help make the CLMTT a reality.